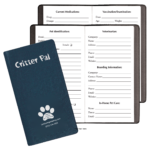 The most popular product we’ve ordered from Payne is the Critter Pal Pet Journal. It’s great for pet sitters and pet caregivers to keep track of care, diet, exercise and more. Payne Publishers has a wide selection of journals, calendars, specialty planners, desk pads, diaries, academic planners and other products which will help you stay in touch with your clients. Their 2017-2018 catalog is called The Power of Planning.